They haven’t had a winter like 2008 for years. Sal sent these photos. Motel with only the second level above the snow. Although the snow is undoubtedly a pain in the a$$ to deal with, the water contained therein is a good thing and long overdue. Thank you for the great pictures. Sal, who regularly posts here, took the pictures. She lives in West Yellowstone. National Weather Service snow model seems to show deeper than normal snow at high elevations and shallower than normal snow at low elevations. I’m no climatologist, but it seems like a warmer climate might produce such a result: Snow won’t accumulate in the warmest areas of the snow belt as the climate gets warmer. All I can say is wow, being born and raised on the Oregon coast I have never seen that much snow. This very deep snow is driving buffalo out of the Park too. There were 53 captured in Gardiner the other day and all but the calves who test negative for brucellosis will be sent to slaughter. The calves will be sent to the quarantine facility. Let the destruction of America’s bison begin in earnest. I wonder how buidlings in the park will hold up–Xanterra winterkeepers are no longer allowed to move snow off the roofs. Canyon and Lake typically get far more snow than West Jellystone. Winterkeepers have been removing snow from the roofs of historic structures like the Old Faithful Inn and Lake Lodge for about 100 years, but Xanterra and the NPS now say it’s too dangerous. We’d rather lose a roof than see a winterkeeper get injured or killed. Then the NPS turns around and sends crews to do dangerous avalanche work at Sylvan Pass for the benefit of Cody’s economy. Go figure. It’s snowing again today. It’s been steady, but not heavy snow this morning. Thanks to Sal for the pictures. I’ve been meaning to get some good winter pictures around town, but just haven’t taken the time to do so. I just need to remember to take my camera with me to work one of these mornings and head out a little early so I can get some pictures. I walk to work every morning (maybe 3-5 exceptions to that this winter) and it has been a good winter to walk. We’ve have lots of snow, but not that much really cold weather. There are definitely many days I am glad I don’t have to deal with my car because of all the snow this year. There’s also been days I would never have been able to get my car out of my garage, even living in town, because of the snow or the berms of snow piled up by the plows. I am in Colorado, and we have a lot more snow in the high country than we’ve had in years too. I knwo that it is a definite challenge now, and will undoubtedly cause some flooding this summer, I am thankful. It is about time. Overlander, is there any weather event that you guys won’t cite as evidence of global warming? Just curious. It is inaccurate to cite ANY single weather event as evidence of ANY climatic change, global warming, cooling, or otherwise. That being said, Monte, what is being discussed here is not a single weather event but a season of snowfall. If I am not mistaken, however, this winter’s above average snowfall can be attributed more accurately to La Nina, which favors increased wintertime precipitation in this region of North America. 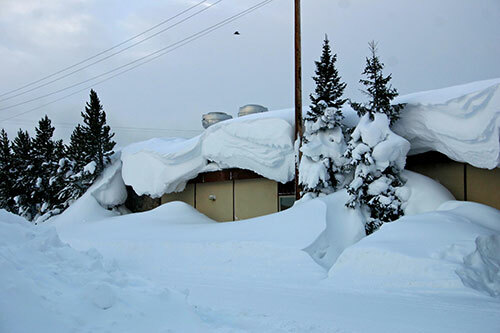 I’m not sure you could go so far as to say that global warming is “causing” this above average snow year in the west. There has been discussion that as global temperatures increase, so too will precipitation, but the more appropriate issue for much of the west is not necessarily how much snow falls but rather when will it melt and how much precipitation will fall is rain at unusual times? Just got some time to look at these since they were sent. First, I would like to give credit to Mike Burdic for the photos, I drove, he took pictures. And also for helping me dig out from the alley where I got high centered –stuck for the first time in thirty years~ at least. The locations of the photos need correction. The second is the Electric Street side of the Holiday Inn looking West. The third is the intersection of South Canyon and Gray Wolf Ave. looking SE. The fourth is the south wall of the Dude Motel and the north wall of a one-story house that is currently occupied. 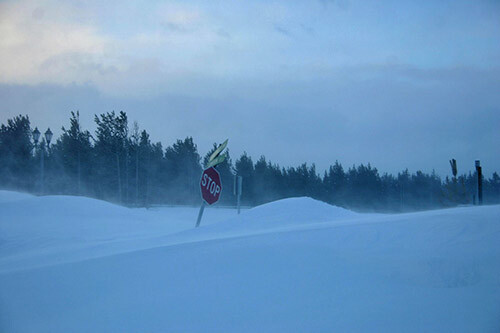 I have been convinced that we are in a constant state of blizzard that is interrupted by temporary breaks in the storm~going on for three weeks now. My entry and exit from my apartment is a forty foot gauntlet-like polar expedition each time I step through the door. 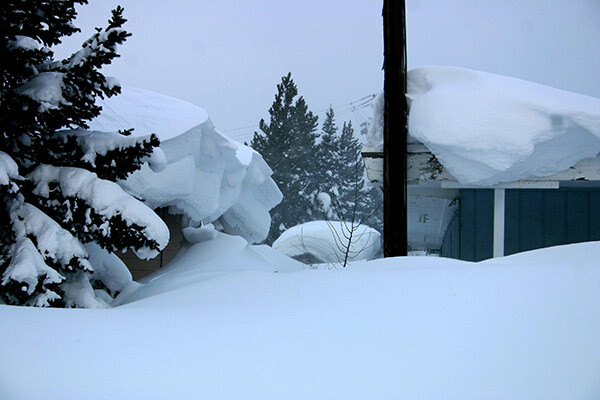 I have often been met immediately with a snow drift up against the door that is anywhere from knee to mid-thigh deep. After a snowy wind blasts me in the face, the door opens inward thank goodness, I have to make it up the next drift from my doorstep, twenty feet further on, where I gain several feet in elevation, I round the corner of the building and descend to something resembling a walkway over which hangs a cornice that is large and reappears quickly after removal. I call it the kamakaze death-trap. I have to pass uncomfortably close underneath it while enduring a sand-blasting by the snow that is laterally swirling through the tunnel created by the building next door and my building. After that I am in more open space to where the real weather is going on. Eventually I get to where I am going on foot or otherwise. Thanks for the corrections, Sal! Above average snowfall ~ in reference to what, may I ask? I remember snow like this all through the late 1970’s and much of the1980’s. What I think is not the norm is the high temperatures in the summers and the snow-less winters with serious arctic chill of the recent decade. The species of trees in this region are tranferring from alpine to subalpine and those found in lower elevations. The last decade of fires seem to be encouraging and abetting the transition. It’s hellaciously dry and hot here in the summer. This snow, provided it melts slowly in the spring, will be helpful for much of the western watersheds in terms of temporary relief from persistent bad drought conditions. Well, I’m not sure if your snowfall in West Yellowstone is technically above, below, or just plain average. Have not checked the data on that one. The discussion veered to using this winter’s snowfall, or more specifically a weather event, as evidence of global warming (I said you can’t). It may very well be that this winter’s snow in West Yellowstone is statistically “average” which is based on a 30 year mean for a particular location. Whether it is climatologically “average” will be interesting once the season is over. I would say though, to answer your question, that in reference to the last several years, it is probably above average, no? Many are making the case that the *climate* of the last several years (below average snowfall, above average temperatures, earlier than average runoff) is the new “average”. But a one year departure from that does not prove or disprove anything. It will take many years to determine which way the trend for all of these statistics will go. The choice of words here is somewhat misleading. “Average” and “Normal” have scientific meanings but they also have plain English or social meanings to us in every day language. When a climatologist talks about averages or normals, they are talking about a mean value measured over a period of time (usually 30 years, but sometimes longer depending on who you are talking to). But to imply avalue is “average” or “normal” in the English language then implies that anything that deviates from that value, be it winter snowfall or summer temperatures, is out of the ordinary or not expected when that could not be farther from the truth. Sal, Our family has a home in West Yellowstone in the Madison Addition. Thank you so much for the pictures. Please post more pictures through out the town and area. 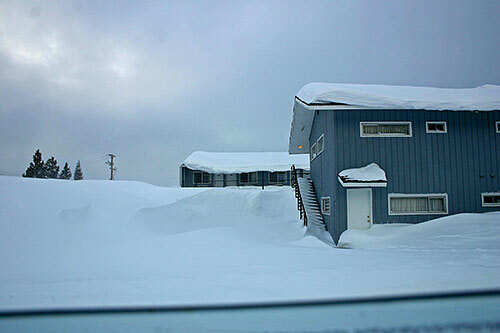 We were up there the last weekend of January and shoveled tons of snow off the roof of the house. We love it too. I’d have to send a few more to Ralph since he administers the blog, but that’s no problem, I have more. It snowed a few more inches today. Many of the structures in the pictures have now been “cleared” or shoveled off by now. You can’t leave that much weight sitting there as the temperature changes make it settled and gain weight. It’s not over yet, just watch the radar images and predictions, it looks like it might be March before snow stops falling here. This IS the way I remember seeing pictures from the 1960’s on where this sort of accumulation was the norm, up until the late eighties and nineties. Sal, I was wondering if you could post some more recent pics of west yellowstone. We are coming up there next weekend to do some snowmobiling, and I want to see how much snow you still have. I understand that it has been fairly warm there the last few days. Is the snow melting much? how much snow do you guys get in february?